The Ford Mustang is the original pony car. What do you need to know before you buy a Ford Mustang? Don’t worry, we’ll tell you everything right here in the Ultimate Buyer’s Guide. In some ways, the Ford Mustang is the American dream. It’s the car that, with a little bit of hard work and maybe a pinch of luck, many people can aspire to own. It’s honest. It’s handsome. It’s made in the good ol’ US of A, and it somehow manages to carry the same tone that the original did over 50 years ago. The new 2015 Mustang offers a slew of new tech. From its new turbocharged four-cylinder engine option to its new suspension and sleek but iconic design, it’s as much of a technological leader as it is an homage to its forebears, and that’s no small feat. The Mustang is all new for 2015. While the new model still offers classic pony car styling, it includes features that are true technological advancements from the outgoing model. Gone is the solid rear axle that has adorned nearly all Mustangs for the past 50 years. In its place, sits an independent rear suspension, a setup that offers better handling and ride quality than the outgoing model. Also new is the 2.3-liter Ecoboost inline four. This new engine is the first four cylinder offered in a Mustang in two decades, and is meant to be the volume seller. If you bought a previous generation Mustang with anything but the eight cylinder engine, you’ve probably been teased with the phrase: “Shoulda bought the V8.” While some may still tease you if you don’t buy the big motor, Ford is offering alternatives that make a strong case for keeping that V8 box unchecked. The new Mustang comes with three powerful engine options: a 3.7-liter naturally aspirated V6, a 2.3-liter turbocharged inline 4, and a big, burly 5.0-liter naturally aspirated V8. All of these engines send their power through either a six speed manual transmission or a six speed conventional automatic. When it comes to fuel economy, the numbers are how you’d expect: the smallest engine ekes out the best mileage and big 5.0-liter V8 lags behind. Still, when you consider their output, all of the engines get pretty respectable mileage. V6 Fastback: Base model. Starts at $23,800. Notable standard features: 3.7-liter Ti-VCT V6, 6-speed manual transmission, air conditioning, dual exhaust, HID headlamps, push-button start, 17” aluminum wheels, Track Apps vehicle performance display, power windows, tilt and telescoping steering wheel, AM/FM six speaker stereo with CD player, SYNC in-vehicle communications system, cloth manual-adjustable seats, 12.5” front and rear brake rotors, 3.15 final drive ratio, 235/55/R17 all season tires, front and side airbags, rear view camera. EcoBoost Fastback: Mid range volume model. Starts at $25,300. Notable standard features over V6 Fastback: 2.3-liter EcoBoost engine, power adjustable front seats, decklid spoiler, Active Noise Cancellation, aluminum finish instrument cluster, fog lamps, 3.31 final drive ratio. V6 Convertible: Convertible version of the V6 Fastback. Starts at $29,300. Same options as the fastback V6 with the addition of a lockable glovebox and without the split folding rear seat. 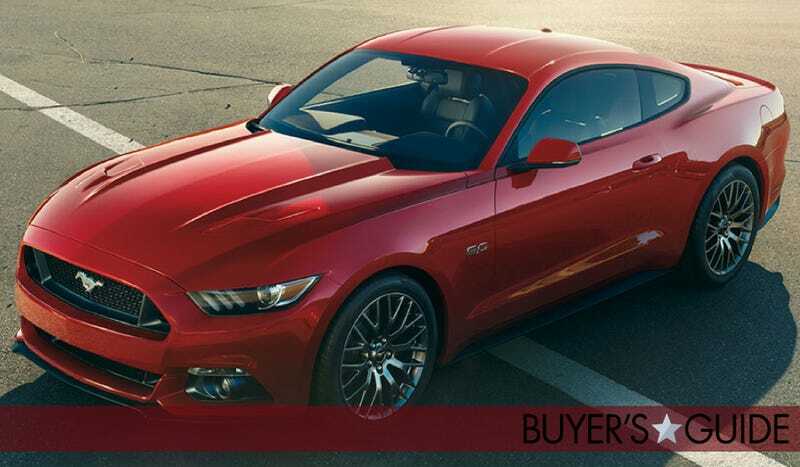 EcoBoost Premium Fastback: Ecoboost Fastback with more features. Starts at $29,300. Notable standard features over EcoBoost Fastback: dual-zone climate control, aluminum pedals, nine speaker AM/FM stereo with CD player, SYNC in-vehicle communications system with MyFord Touch, Satellite Radio, heated and cooled leather trimmed seats, unique interior trim, heated mirrors, Pony projection lights, rear diffuser, selectable drive modes, 18” aluminum wheels. GT Fastback: Base V8 model. Starts at $32,300. Notable standard features over V6 Fastback: 5.0-liter V8 engine, power seats, fog lamps, unique decklid spoiler, 14” front brake rotors, 13” rear brake rotors, electronic Line-Lock, 3.31 final drive ratio, launch control, hood vents, 18” aluminum wheels. EcoBoost Premium Convertible: Convertible version of the EcoBoost Premium Fastback. Starts at $34,800. Same options as the Premium Fastback V6 with the addition of a lockable glovebox and without the split folding rear seat. GT Premium Fastback: GT Fastback with more features. Starts at $36,300. Notable standard features over GT Fastback: dual-zone climate control, aluminum pedals, nine speaker AM/FM stereo with CD player, SYNC in-vehicle communications system with MyFord Touch, Satellite Radio, heated and cooled leather trimmed seats, unique interior trim, heated mirrors, Pony projection lights, rear diffuser, selectable drive modes, 18” aluminum wheels. GT Premium Convertible: Convertible version of the GT Premium Fastback. Starts at $41,800. Same options as the Premium Fastback GT with the addition of a lockable glovebox and without the split folding rear seat. Note: no performance package available on V8 convertible. Ford is targeting Millennials with this new Mustang, and there are few things youngsters like more than variety. Like pretty much all mustangs before, the new pony car can be had with every option under the sun. After driving the new Mustang, the sweet spot appears to be the GT with the $1,595 Recaro seat option and the $2,495 GT performance package. With the bigger calipers and rotors up front, reworked suspension, 19” black wheels wrapped in Pirelli P Zeros, and 3.73 Torsen rear diff, we think this setup gets you the ultimate in Mustang performance. Outfit a Mustang like this, and you’ll make cars costing twice as much quake in their boots.